This is a small group question and answer session that Bashar gave in 2004. We are pleased to now make this available! Envisioning a frequency as a color. Controlling conscious thoughts and dealing with subconscious thoughts that are embedded and need releasing. Relating to ailments and diseases and how they serve you. Experiencing upsetting events during your day. Sensing energies from other lives. Liquid light and electromagnetheric energy. Wanting to act as a healer. Estrangement from a family member. Why did the US go into Iraq? The Four Laws of Creation. Super ionized water, and monotomic elements and how they effect us. Gaining mastery in our lives. Commercializing space and space vehicles. Wanting to become a space pilot? Jobs we have in other dimensions. Free will and ideas of destiny in your lifetime. What does our government know about aliens? Will telepathy become common place in our society? Intended purpose of the ego. Healing modalities and the effects they have. 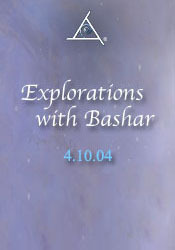 Is Bashar moving into another dimension and does he have an ego? Soul mates, twin souls and agreements that are made. Comments about Reptilians and who they are.